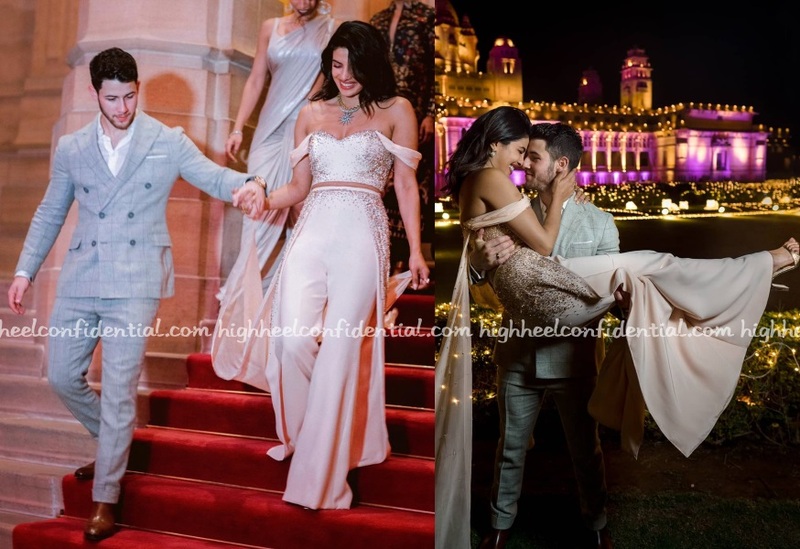 Thanks to her stylist, we have a few more pics of Priyanka and Nick from their wedding festivities. Priyanka was seen wearing custom Ralph & Russo jumpsuit to one event and a siren red Dior with a Sabyasachi dupatta to another. Looks like even a Dior dress cannot escape Sabya’s chipkoo styling. The jewelry and styling are taking away from what could’ve been a great look with wavy open hair and a strand necklace. The jumpsuit look is good and both hair and jewelry are on point. Loved her in the red Dior gown. Am not sure the Sabyasachi dupatta was necessary, but it doesn’t take away from the look. The jumpsuit looks great on her as well. She looks great. All her wedding outfits on point…no otts, no whacky getups, no repetetiveness. She looks gorgeous in each one of them. Absolutely gorgeous and stunning looks! Why haden’t these been shared before? Good palate cleanser after heavy duty lehanga-shaadis! Gowns and bangles?? As if Deepika wasnt enough. I am divided which look is worse, Priyanka in blood red gown or deepika in black! Both tired to pull almost the same look and failed on many levels. Why Maang tika, bangles and dupatta with such a beautiful red dress. Complete downer combination. Rather wear a complete Indian attire. Jump suit was good though, the color looks great on her. But wish she had skipped the necklace. This French/Anglo dish with a desi tadka is giving major ‘i am a hollywood/bollywood celebrity’ vibes. And it’s very, very pretentious. Maangtikka with a Dior? At this rate she will wear a Burberry with a navvari .